and plays simple endgames flawlessly afterwards. 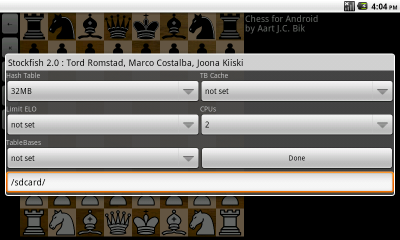 The setup will be in the next release of Chess for Android. Multi-core Android devices are becoming more widespread. Therefore, v2.8.2. of Chess for Android, available from the Android Market or as direct download, adds support for setting up UCI engines with parallel search. Unfortunately, the UCI protocol did not standardize the option name for parallel search (despite some efforts) so the GUI simply looks in the UCI engine output for commonly used option names like "Cores", "Processors", "Threads", and "CPUs". The GUI then presents this choice in the option setup window (always labeled as CPUs), and eventually sends any selected value back to the engine using the recognized option name. Please let me know if you would like to see alternative option names for other UCI engines on Android with parallel search. As for all other options, only option values supported by the engine can be selected in the setup window. Below a screenshot of the new UCI option setup window. It is nice to hear that others sometimes find my toy projects useful. As I reported in an earlier blog entry, a while back I implemented a 6510 cross-assembler to relive the good old times of programming a Commodore 64. Today I got an email from Antonino Brisindi who is using this assembler to burn an EPROM for his home-made 6502-based microcomputer. Below you see a picture of his impressive project in progress. 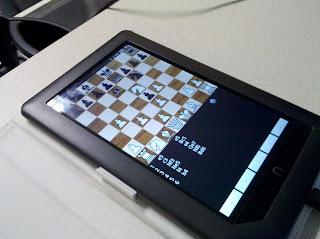 Marc F. Ferguson is writing about experiences with rooting the Nook Color on his blog FergyTech and he kindly emailed me the following pictures of Chess for Android running on the Nook Color. It is cool to see so many new devices running Android. Thanks Marc! I compiled Ben-Hur Carlos Langoni's UCI engine RedQueen for Android (ARM), and put the binary on UCI engines for Android. Below screenshots and results of a few quick matches against other engines on a Nexus One (1GHz Snapdragon) with 32MB hash and Nalimov/Gaviota/Scorpio endgame tablebases on SD card. 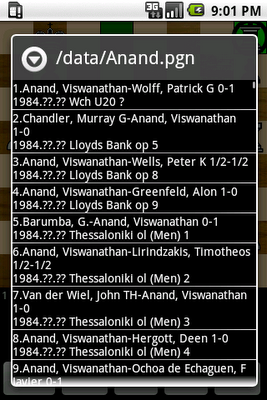 I just released version 2.8 of Chess for Android, available from the Android Market or as direct download. full PGN support (clipboard import/export, file load/save)improved layout for xlarge screen sizes (api 9 and up)bug fix in draw detection after FEN importTo load a game from a file in PGN format, long press the notation window, select "Load Game from SD", and navigate to the file. This opens another window with the actual games in that file. Then select the desired game. Very large PGN files may take a while to download (or even run out of memory), but the idea is that future versions will be able to navigate quickly between successive games. I have tried to make the PGN parser reasonably robust (it accepts sloppy SAN for instance), but certain non-standard constructs are rejected. Please let me know if you encounter bugs though.